Curator talk: Tim Barringer, Oct. 22, 7-9 p.m.
One of the most captivating stories in the history of art is the evolution of the tradition of British landscape painting, from the 17th century onward. It's not just a narrative about an artistic genre; it's a chronicle of a nation's relationship with the land and how that relationship has changed over time. The traveling exhibit The British Passion for Landscape: Masterpieces From National Museum Wales—making a visit at the Utah Museum of Fine Arts at the University of Utah—demonstrates this artistic progression with more than 60 works by some of the most renowned names in art history, from Turner and Constable to Gainsborough and Monet. Luke Kelly, associate curator of antiquities at the museum, is organizing the exhibit and notes that the stop is the result of multidisciplinary coordination. In 2010, Yale University art-history professor Tim Barringer was lecturing here, and he mentioned to UMFA Executive Director Gretchen Dietrich a traveling exhibit of British landscapes he was assembling with the National Museum of Wales seemed like a good fit. After Dietrich's pursuit of the exhibit, the university became the third of four U.S. stops. The timeline of artworks in the exhibit charts the transformation of Britain from a rural, agrarian society to a powerhouse of the Industrial Revolution and beyond. Kelly observes that Oliver Fairclough, of the National Museum of Wales, organized the works into six sections, corresponding roughly to historical periods. The first, "Classical Visions & Picturesque Perspectives," finds British artists in the mid-1800s looking toward continental works for inspiration. "British artists like Richard Wilson, who had made the 'grand tour' of the continent, would see their artwork, and emulate that," Kelly explains. "Wilson took the Welsh landmark 'Dinas Bran Castle' (early 1770s) and transplanted it to an Italian landscape setting." The next section, "Turner & The Sublime," is in some ways the most dramatic. "J.M.W. Turner was such a pivotal figure," Kelly maintains. 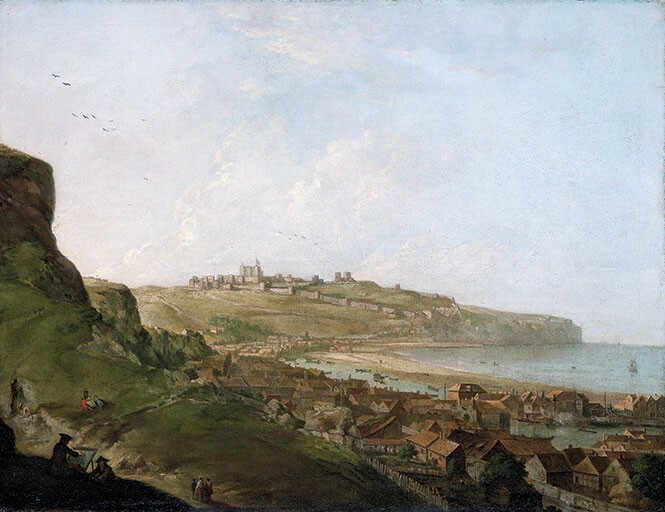 "Before Turner, landscape was not to be celebrated for its own merits. Landscape was background for portraiture or historical figures. Turner is always looking for a new way to depict atmosphere, light, storms." Turner's life was the subject of the Oscar-nominated 2014 film Mr. Turner, which will receive a free screening in conjunction with the exhibit on Sept. 30. Turner was experimenting with technique in watercolors, for which he isn't as well known. "By the 1830s, with 'Flint Castle,' you have this gorgeous, light-filled watercolor that almost looks like an oil painting," Kelly notes. 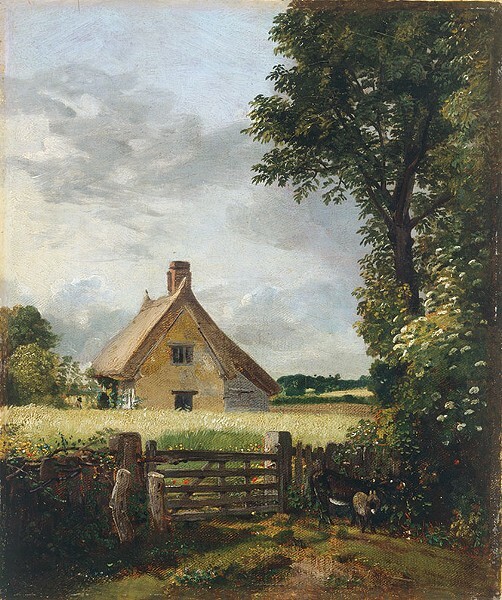 John Constable's "A Cottage In a Cornfield"
"Truth to Nature' is the third section, showcasing John Constable, whose rivalry with Turner became the stuff of legend. "Where you can see Turner turning up the atmosphere, Constable is simply celebrating the natural beauty of Suffolk County, where he was from, in his 'A Cottage in a Cornfield' (1817)." This section also includes examples of the then-new medium of photography. The exhibit transitions into "Picturing Modernity," which follows Britain into the Industrial Revolution, with its mines and steelworks. "Turner embraced it; Constable didn't," Kelly explains. "Lionel Walden's 'Cardiff Steelworks At Night' (1895-97) is almost an 'industrial sublime.' For some, it was awful, but it had its own beauty." "Monet & Impressions of Britain" provides fascinating glimpses of the French Impressionist's visits to Britain in the late 19th and early 20th centuries. "Charing Cross Bridge" (1902) is unmistakeable as the artist's work, yet captures a very different subject matter for him. "Monet embraced the fog; he was enthralled by London," Kelly notes. Other artists in this section used impressionist techniques to depict the English countryside. The final section, "Neoromantic to Postmodern," assembles works in myriad styles, from expressionism to social realism and surrealism. Land art works by David Welsh and Hamish Fulton have a special resonance for the museum, with its interest in that medium. "Fulton is known as 'the walking artist,' and went on a tour of the English countryside," Kelly explains. "He went not to find art, but walking was the art." In Utah, there is a special relation to this exhibit because, like the British, we have long had a passion for our natural environs as a symbol of our heritage. But amid the struggle between state and federal agencies for control of the land, that relationship is sometimes complicated. The exhibit Constructing Utah Landscape runs concurrently with The British Passion for Landscape, with interactive features to help viewers ponder the questions of how to construct a landscape, and what a "landscape" is. We come to see all these works not as mere artifacts but as "interventions into the landscape," as Barringer calls it in Passions Green & Dark Satanic Mills, an accompanying book. Those questions are still being pondered by artists all over the world. "What this show tells us," Kelly believes, "is that English landscape is not a dead subject, but that artists are still enthralled by it. How are artists going to approach it, and how will they build upon it?"